There is a specific level of knowledge required for even entry level positions in the military. The ASVAB, or the Armed Services Vocational Aptitude Battery, consists of multiple choice questions to test the aptitude of military applicants. Each subtest will have a number of key questions to determine an applicant’s aptitude. By reviewing and practicing tests that are targeted to those preparing for the ASVAB, your level of confidence and competency in answering said questions will increase. While you could garner success in practicing general math and English skills, practicing ASVAB style questions will have a greater likelihood of improving your score on your actual test. The key is having time to understand how the questions may be worded for this type of exam. ASVAB Boot Camp provides a comprehensive approach to help you study for the ASVAB. Our customers’ favorite ASVAB study package includes online courses and practice tests for Arithmetic Reasoning, Word Knowledge, Mathematics Knowledge and Paragraph Comprehension. The programs also include 4 full-length practice tests with detailed answer explanations; interactive practice exercises to improve memory retention; and access to ASVAB Advisors to answer your questions. Arithmetic Reasoning – This section is comprised of math word problems where the solution is not always straightforward. The test taker must be able to both do math and read well to conclude the correct answer. EXAMPLE: 143 females and 93 males work at a hospital. The percentage of males working at the hospital are? Explanation: Add the number of female and male workers to get a total number of 236. The number of males, 93 is divided by the total 236 to get 0.394; multiply by 100 to get the percentage value and the answer is 39%. Mathematical Knowledge – This section clearly looks at your ability to solve straightforward math equations, with a heavy emphasis on understanding the order in which math operations must be calculated. EXAMPLE: Solve: 11 (62 – 3) – (2 × 94) = ? Explanation: Perform the operations in the parentheses first, then do, multiplication and subtraction: (11 × 59) – 188 = 649 – 188 = 461. Paragraph Comprehension – You will be provided with a general paragraph on any topic. Then you are required to answer a question that best describes what you just understood from the paragraph. This section will gauge your comprehension of paragraph and sentence structures and ability to identify key points on any topic. EXAMPLE: Reptiles and birds have several key differences. The first involves the skeletal structure between the two – reptiles have solid bones that are dense and they travel on land or in the water. Birds have hollow or pneumatic bones filled with air that are lighter and allow them to fly. In addition, birds have a lightweight beak instead of teeth, or a heavy jaw. a) travel faster than reptiles b) may have a heavy jaw c) do not have teeth d) have a solid bone structure. Answer: c) Do not have teeth. Word Knowledge – Questions are laid out in the manner that one would see in a dictionary or thesaurus. In this section, you will be asked to explain the meaning or find a similar word. EXAMPLE: Emulate is most closely associated with: a) discipline, b) imitate, c) approve, d) amaze. Explanation: To emulate something is to strive to imitate it. These are just a few examples of the style of questions you may see on the ASVAB exam. 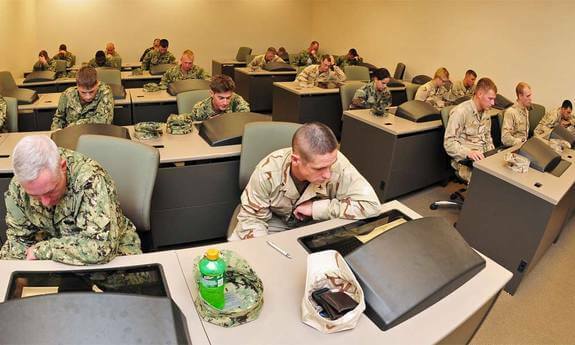 Contact us at ASVAB Boot Camp at (830) 28-ASVAB or (830) 282-7822 or e-mail info@asvabbootcamp.com if you need help in choosing a study program that best meet your needs in preparing for the ASVAB.